A team of physicists from University of California, Santa Barbara has provided the first clear demonstration that the theory of quantum mechanics applies to the mechanical motion of an object large enough to be seen by the naked eye. Their work satisfies a longstanding goal among physicists. 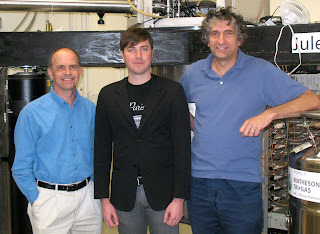 In a paper published in the March 17 issue of the advance online journal Nature , Aaron O'Connell, a doctoral student in physics, and John Martinis and Andrew Cleland, professors of physics, describe the first demonstration of a mechanical resonator that has been cooled to the quantum ground state, the lowest level of vibration allowed by quantum mechanics. 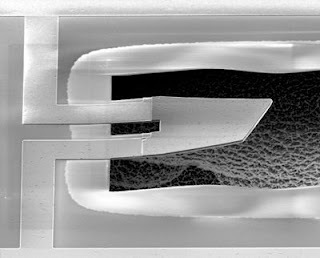 With the mechanical resonator as close as possible to being perfectly still, they added a single quantum of energy to the resonator using a quantum bit (qubit) to produce the excitation. The resonator responded precisely as predicted by the theory of quantum mechanics. A. D. O’Connell, M. Hofheinz, M. Ansmann, Radoslaw C. Bialczak, M. Lenander, Erik Lucero, M. Neeley, D. Sank, H. Wang, M. Weides, J. Wenner, John M. Martinis & A. N. Cleland, "Quantum ground state and single-phonon control of a mechanical resonator", Nature advance online publication 17 March 2010 [doi:10.1038/nature08967]. Abstract.